MOSCOW. 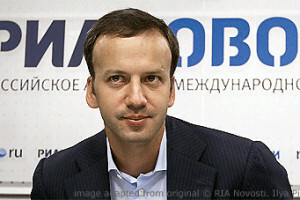 March 22 (Interfax) – The difference between the current individual income tax rate, 13%, and the rate now under discussion, 15%, is not dramatic, Deputy Prime Minister Arkady Dvorkovich said, emphasizing that the president would make a final decision on the rate. “The 13% income tax rate is not a fetish. I don’t think that the difference between 13% and 15% is such that people are all going to flee the country,” Dvorkovich said on Thursday at a meeting with students of the Plekhanov Russian University of Economics. “If the decision [on an increase] is submitted, then the president will make the decision,” Dvorkovich said. Taxes were discussed at a meeting held by Prime Minister Dmitry Medvedev on Wednesday. “The economy is developing, there are major tasks which now have to be addressed, including tasks emanating from the president’s address. And the tax system does indeed need certain adjustment,” Medvedev said. At the meeting, an increase in the individual income tax rate by 2 percentage points to 15%, together with introduction of a minimum exemption, was discussed, the newspaper Vedomosti reported. This idea was also analyzed last year, when the majority opinion was that it made sense to settle on the basic adjustments to the tax system before the presidential election on March 18. The Finance Ministry opposes an increase in the income tax rate. “I am an opponent of changes to individual income tax rates. There are various proposals, to make it progressive, raise rates, make a progression with a nontaxable minimum. It seems to me there is no need to touch a tax that is operating normally, collecting. The public is used to this tax, therefore increasing the rate, making it progressive, would lead to thinking about how to circumvent it. A flat 13% rate is entirely competitive,” Finance Minister Anton Siluanov said.